For a short period of time the harsh extremes of the desert do not and exist and life florishes. If you drive into Joshua Tree’s south entrance you can’t miss the painterly scene along interstate 10. A painter must have painted the desert yellow, the brittle brush line both sides of the highways at points. At a 65 mile per hour glance I could make out beavertails blooming along with ocotillos and some arizona lupine here and there. You can see all the brittle brush here in the background behind me here . I just met Jon Cornforth the current Outdoor Photography Magazine cover shot photographer earlier this week. Pretty hospitable guy, he was nice enough to share his I-phone shot. Hopefully I can meet up with him again after I get back from Northwestern Nevada. The photo shown was taken just outside the park’s south entrance. 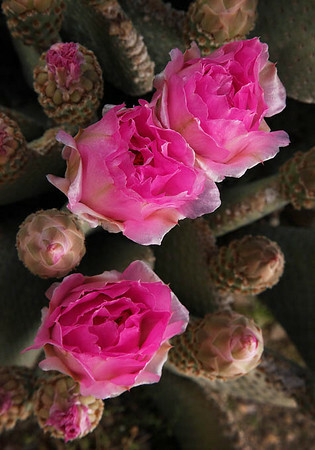 Here are a few of the blooming cacti and yucca from the past couple of visits to Joshua Tree. They are all blooming now so it would a great time to stop by, especially if you’re conveniently located on the east side of Los Angeles. If you happen to smell a skunk while you’re out there it might just possibly be the breeze and the smell of an abundance of wildflowers. I found these in both the Mojave and Sonoran sections of the park. I found these mojave mounds at the foot of boulder piles in the main northern section of the park. The joshua trees are in full bloom right now. This one is just at it’s beginning stage but you’ll find many in full bloom. 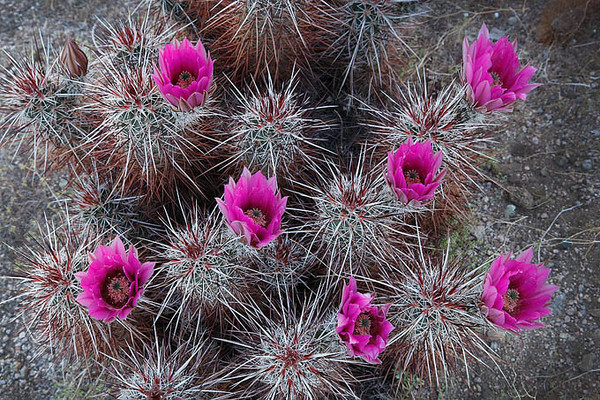 The beavertail cacti can grow to the size of a large ice chest with mutliple flowers on them. 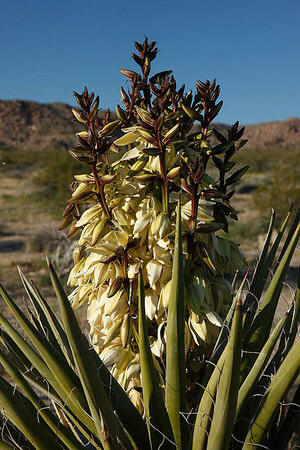 The mojave yucca, whew! In my own opinion these can be some of the most beautiful yucca blooms around. This should give a photographer plenty to capture in Joshua Tree besides just boulders and joshua trees. If you still need more just remember the park is made of mountains, washes, tanks and palm oasis. Get creative and come up with something you didn’t think you would leave with. This entry was posted on April 9, 2010 at 7:37 pm and is filed under Uncategorized. You can follow any responses to this entry through the RSS 2.0 feed. You can leave a response, or trackback from your own site. looks wonderful! I need to get out west soon. Great images. The top one is especially nice. Sort of a collage of cactus plants and blooms. Beautiful work Steve. 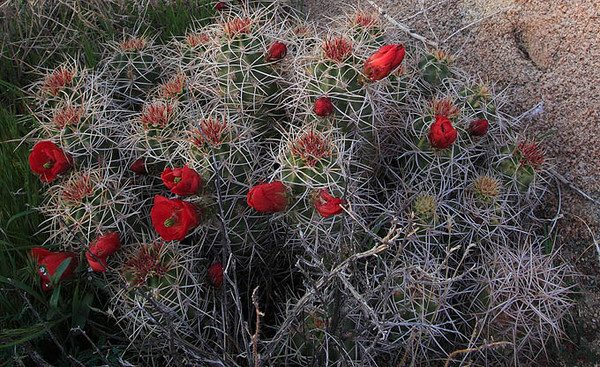 Its amazing how the flora of the desert comes alive and the hidden beauty comes out. 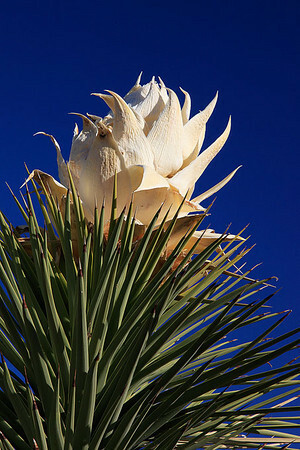 I never knew the yuccas actually bloomed, I must get out more instead of living vicuriously through your photographs. The Mojave Yucca is very unique! Beautiful shots, Steve. The variety is wonderful.